Kalila Smith has been a name imbedded in my head since I experienced the New Orleans Ghost Tours. The first book of hers I ever bought was New Orleans Ghosts, Voodoo, and Vampires and I was hooked since. For years, I had wanted to meet her and when I opened the guidelines for Southern Haunts: Spirits that Walk Among Us, I was beyond thrilled to work with her. The first time I met her face to face was at a convention and we just happened to bump into one another. We had that pause moment, where we looked at one another like we had known each other for a lifetime. Then after a huge hug, we immediately clicked, and I have her to thank for my level of spirituality that I now have. It is my greatest pleasure to interview a woman that I highly respect and that I feel is perfect to feature on my blog during the week of Halloween! Kalila was born and raised in New Orleans. She personally researched and wrote the material featured on Haunted History Tours of New Orleans’ Ghost, Vampire and Spellbound tours. 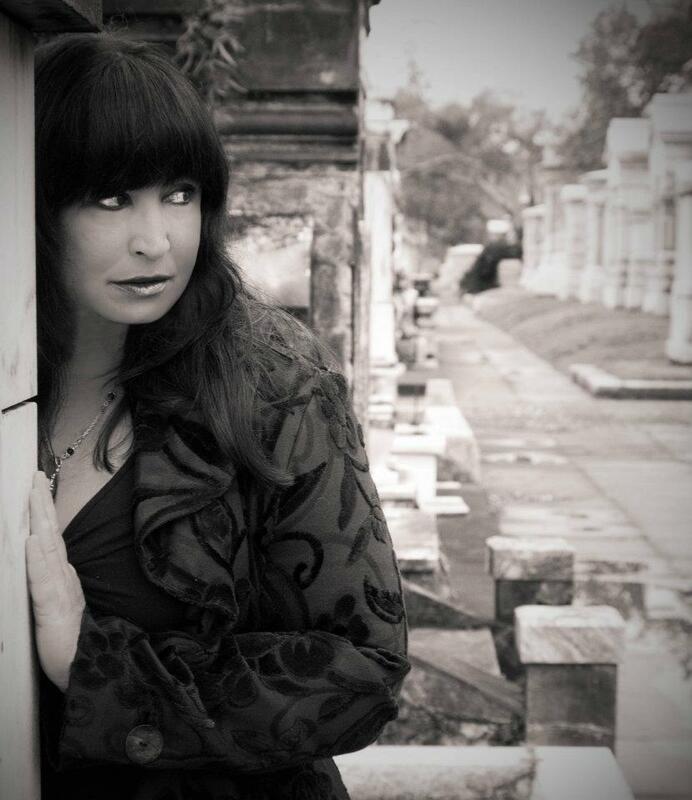 She is the author of New Orleans Ghosts, Voodoo, & Vampires, and Tales from the French Quarter, and Miami’s Dark Tales. Her newest book is Afterlife Mysteries Revealed. Her work as an intuitive psychic has been recognized for over 2 decades worldwide. She has been featured on and worked behind the scenes on television productions including Travel Daily, Places of Mystery, Secret New Orleans, Unsolved Mysteries, FEAR!, MTV’s On The Road, Blind Date, Hidden New Orleans, Urban Legends, America’s Most Haunted Places, In Search of…, and Supernatural Destinations. She appeared in the motion picture, “The St. Francisville Experience.” She wrote and directed “Journey Into Darkness… The Trilogy”, a video documentary, featured in segment in television broadcast in the US & UK. And worked on and appeared in the documentary for Sony’s Playstation II game, Ghosthunter. She conducted all of the paranormal investigations for the local television show, “Haunted New Orleans.” She was a producer in the PBS documentary “Southern Haunts” New Orleans episode produced by Sky Dive Films. Several of her true crime stories were featured in articles in Examiner.com and the National Crime and Punishment Museum Blog page. Check out her short story “The Bequest” in Southern Haunts; Spirits That Walk Among Us. Another short story, “The Devil’s Doorway” will be featured in the second Southern Haunts Anthology, and “Bayou Loup,” a werewolf story featured in “Luna’s Children,” a werewolf anthology. Halloween is when the veil between our world and the spirit world is the thinnest. My most memorable Halloweens are the ones I shared with my kids when they were little. I was so busy one year, I just didn’t costume. I didn’t have time, I was worn out but then felt bad that I didn’t take part in the festivities. When I got to work, I ran to Walgreens’ and picked up some cheap Halloween makeup and put white on my face and dark under my eyes and called myself a zombie! I did my tours that night and everyone loved it! A couple of years ago I did Medusa with plastic snakes and a wig. The snakes were painted with a paint that caused my sinuses to close up and the bobby pins were stabbing me in the head. It turned into the worst headache of my life. Never again! I work and I have worked on Halloween doing ghost tours, séances and readings for 19 years now. Hollywood is usually to blame for giving a bad name to anything mysterious turning into something dark and evil. What do you do to keep the ghost and ghouls away on Halloween night? Well, we do séances and of course say prayers and sing to raise the vibration to keep lower vibrational spirits away. New Orleans’ cockroaches. Why? They fly. One of my favorites that scared me beyond words was the Jeepers Creepers. Being stranded on a deserted country road with a monster after you, is pretty creepy. But I’m a classic horror buff. I like old school horror and anything Stephen King! Cujo by Stephen King because as I read it, it was as if I was there. During the car scene I actually felt very trapped and claustrophobic. He really made that character come to life and it’s so frightening because it could actually happen. What can be scarier? Legends I heard growing up in the bayous of South Louisiana. I grew up hearing some really scary stories about ghosts, vampires, werewolves, and other monsters. Absolutely! In fact, I’m sitting on a couple of short stories waiting for the right anthology to come along.